Emma combines the science and knowledge of EFT, mindfulness and various types of energy medicine, with her knowledge of classical horsemanship in order to facilitate emotional, behavioural and physical change in both people and horses. Emma is a qualified EFT, Inner Re-Patterning and Reiki Master Teacher/Trainer as well as being a master practitioner of NLP, Hypnotherapy, Time Line Therapy™ and Scenar Therapy. 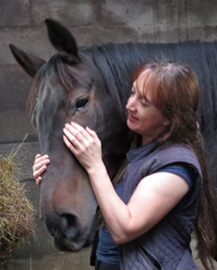 She is passionate about helping people to develop and nurture their equine partnership, releasing stress and tension, in both themselves and their horses, through learning to ‘connect and reflect’. One of her favourite offerings is teaching people to meditate with their horse for physical, emotional and mental transformation. She offers one-to-one sessions regularly throughout the North West of England both with and without horses, depending on the individual requirements, and via skype on an international basis. Emma also runs a wide variety of workshops, clinics and trainings which are available throughout Europe on request. Her sessions and workshops are lively, varied as well as peaceful and respectful of both the individual’s and group’s needs in the moment. She works with all sorts of issues including leadership development, confidence building, releasing trauma, personal development, both physical and mental performance coaching, as well as chronic and complex health issues in horses and humans. Emma has been a prolific public speaker and event organiser throughout her career and is available for both small groups and international conferences interested in her energy work with horses. Her talks are full of stories, experiential learning and her passion and love for helping horses and people shines through.